DESCRIPTION : Catoblepas. 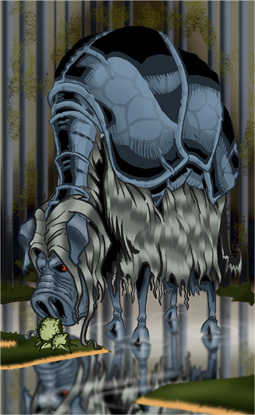 One of a series of illustrations of lesser known mythical creatures. Feel for the shaggy and melancholy Catoblepas. One part buffalo and one part swine, its back is covered with a protective armor. But that armor -combined with its long weak neck and heavy-browed skull- mean that it is doomed to never raise its head and to always stare at the ground around it. But, what may be be curse for the Catoblepas is a blessing for anyone who encounters the beast in the wild. For its sad, bloodshot eyes will cause instant death. And its breath will transform a man to stone, because of its diet of poisonous plants and fungi.